I have lots of good news to report! 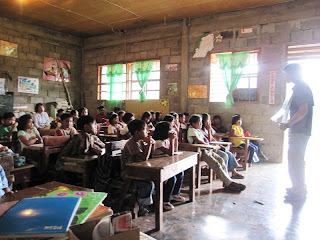 The Guina'ang 1Book project is taking on a life of it's own. 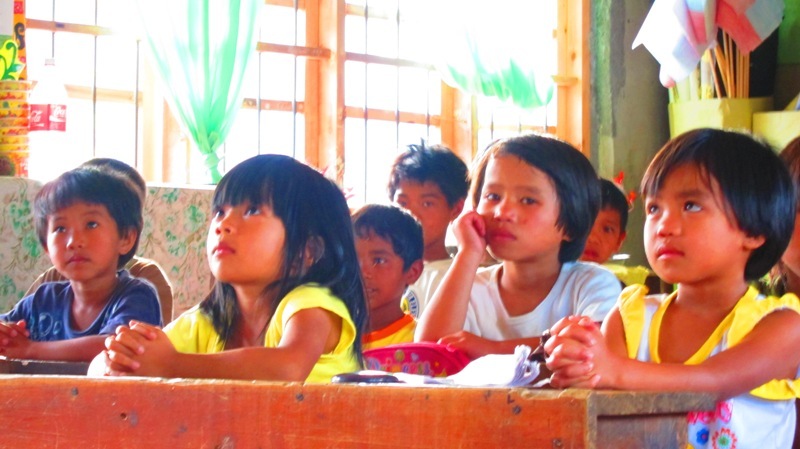 Here in the Philippines, school is back in session and the seeds of intention sewn back in December are blossoming. When we first talked about "building a library", I honestly was kinda just thinking "books". Of course, you gotta be careful about what words you use-- We did in fact say "build a library". 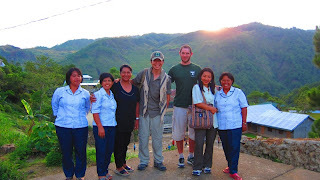 Two weeks ago, I met Derek and Andrew as they were passing through Sagada. Derek and Andrew were deeply interested in what we are doing. 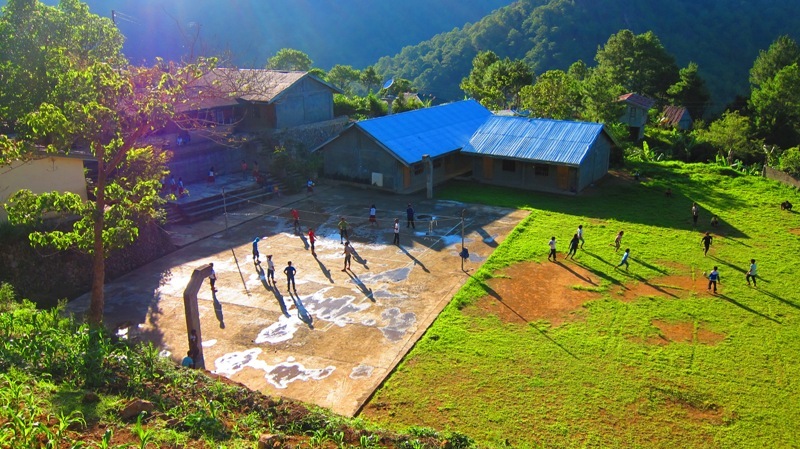 After coordinating with Manuela, the principal, they set out a day later on the rough mountain road to visit the school. They stayed the night and then met the teachers and students in the morning. It was an all around luminous experience of connection. Andrew was the first real American most had ever met! Andrew talked about the USA and his home in Washington D.C. Derek (their second Canadian!) talked about the children of Afghanistan where he had last worked. The Guina'ang students have little global experience. 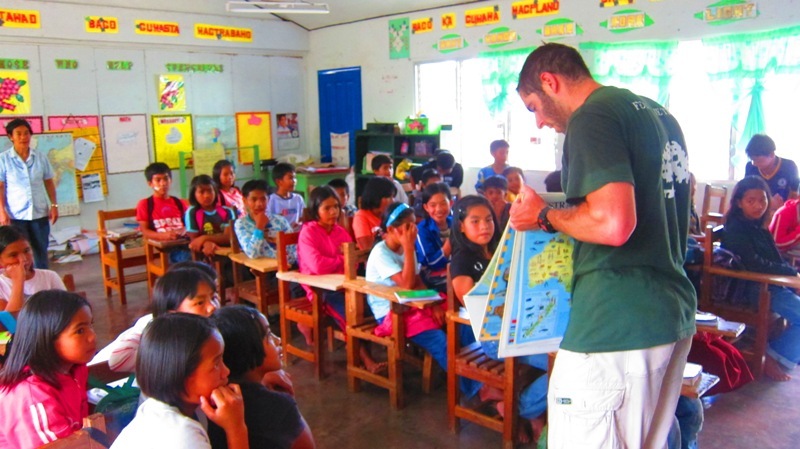 The brief presentations will be experiences the kids won't forget for a long time. Derek has a military background, and just as he would do back on the job, he conducted a thorough field assessment of the library situation at Guina'ang. This included scouting out the terrain and logistics for an independent library building. Only a few days later, Derek and I met Andrew B.-- a world class Australian architect who designs mega buildings in the middle east. A little tired of fancy-dancy-building-designing, Andrew B. jumped at the chance to help out. As I type he is making his way back from the school after also braving the rugged mountain road and the enthusiastic kids! We are now talking about a potential mandalic library design. We are envisioning a building that makes use of the local building materials, yet leverages the latest global eco-innovative building techniques we've got going on in Canada and Australia-- like the use of timber frames and straw bales. You should see the amazing timber they have here. With Andrew's help, the right builders, and a combo of local resources and global innovation, we can manifest a structure that is a regional inspiration! In the meantime, crates of books are arriving now from Lorraine in BC, and Ray in Manitoba (his box was too heavy for his van!). In Manila the youth of a Muslim/Christian youth group that I have worked with heared about the project. They live in the humblest of neighborhoods, but, scoured their shelves and came up with two boxes of books for "our brothers and sisters in mountain province". See their portrait below. I head there soon to lead the mandala workshop with school-- this is where the school gets to give back to you guys. Thank you everybody for your support, books, donations and kind words. 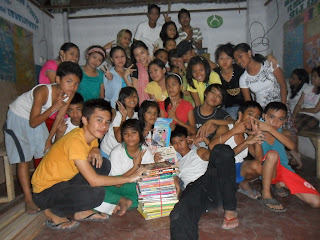 The Muslim Christian Youth of Tala pose with the 1Books they've collected for Guina'ang. 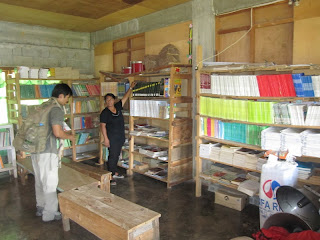 The current makeshift library-- those are all our books in the corner! I should really be blogging about this. This would be the type of experience that anthropologists and travelers dream of. To me it's just becoming my routine daily life. Regardless-- I should really write about it! So here goes. My Igorot basketball buddies (Igorot is the name of the tribe here) invited me to join in one of their thrice yearly rituals yesterday. I was a bit reluctant-- they take these things pretty seriously, wearing their best tribal attire-- and I am very conscientious not to intrude. Yet, they insisted. So, I skipped my regular morning WIFI check and headed out across the rice paddies towards the town's sacred tree. On the way I met my friends. I hardly recognized them because they were wearing loin cloths, adorned in wild boar tusks and carrying spears. As they crossed the rice paddies with me, the vibrant red of their attire silhouetted majestically against the verdant green of the harvest ready rice. Watching them march in single file with their spears held high, I felt as if I had been swept into a time machine, watching an ephemeral vision of ancient days. They led me up to the Dop-ai (the central village fire pit, social hub, and decision making centre). There I waited while they went up to the sacred tree for the first prayer. 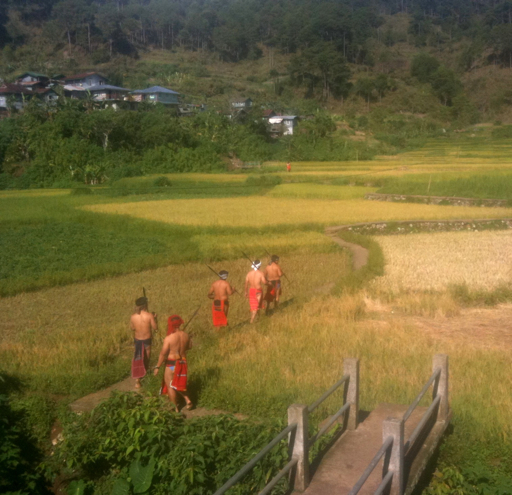 Contigents of six Igorot began arriving from all the different barangays (sub-villages). They all converged at the top of the hill around the tree. They yelled and whooped as they made their way up. Prior to gathering they had all bathed ritually in the river to purify themselves. The shaman, who led the ritual, had been fasting for two days in preparation. 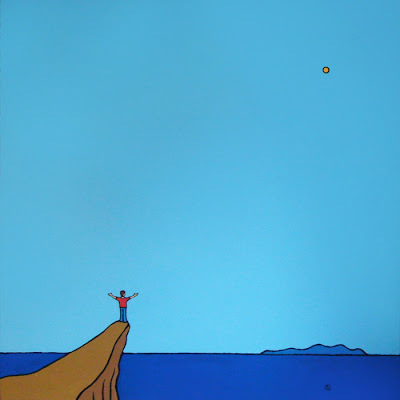 There on the hill-top he lead the prayers for an abundant harvest. When the Igorot men had finished, they descended carrying pigs, dogs and chickens. The Do-pai is a little like a mini stonehenge made of river rocks and large erect stones. It quickly filled with the chanting men and reluctant animals. The shaman, adorned in a majestically feathered hat, and wearing a great necklace of wild boar tusks that had been passed down through many generations, then proceeded over the slaughter. I watched from a disconcertingly close distance with my new friend Muriel. We vowed we wouldnt be eating any dog! The screeches of the pigs could be heared echoing throughout the valley. Once completed, the women, they too adorned in their vibrant red Tapis (woven skirt), coloured beads, and snake vertebrae head bands, made their way in a single line to the Do-pai. The men gathered the gifts of rice wine, bread, drink and rice that each women brought. The chanting resumed and all partook together in a ritual dance to the mesmirizing beat of the brass gongs. Once the dance was complete, the contingents of men began to depart the way they had come. This time however, the prongs of their spears hung heavy with great chunks of bloody meat. Laden-so the men headed back to their respective Barangay Do-pai's. 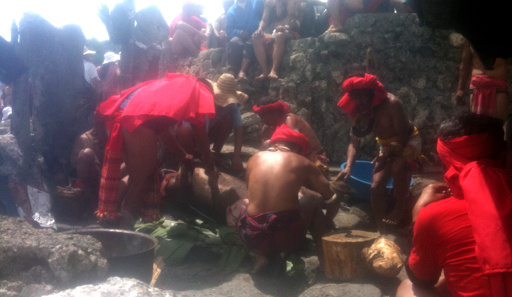 There, in the dozen or so Barangays that make up Sagada, the men would cook the meat, pray and share stories around the fire. The rice harvest would begin the next day. I too started to head home. I hadn't yet checked my e-mail!! On my way, I passed one of the other Barangay Do-pai's. The men had already gathered there and had begun to cook their meat. One of the guys I play basketball with called me over to join them. I motioned that I was heading onwards. Having gone a ways ahead, I stopped, overcome with a feeling that I should return. I said goodbye to Muriel, turned around, and went back to the Do-pai. The Do-Pai's are like really a mini stonehenge. Particularly this one. They are just for the men, the women having their seperate communal house. Pageleyn, my buddy, was glad to see me back. He explained that the tall stones sticking up around the fire pit were over 600 years old. Many had been erected to commemorate the community's warriors who had lost their heads to the neighboring tribes in days long long past. This was one of the oldest dopai's in the area. I joined the men sitting around the fire and bubbling pot. We sat in a rest-full, contemplative silence, sipping rice wine, watching the fire and waiting for the food. When the meal was ready, the oldest man began to pray. He prayed and prayed. It was as if he were having a conversation with the beasts chopped up in the pot. His speech was in thick and old Kakana'ue (the local dialect). I could only understand a little, yet observed that at one point in the prayer, he was curiously interrupted by another old man and some intense words were exchanged. It wasn't til afterwards that my friend translated what had transpired. The soup and meal were stupendous. It consisted of chicken boiled with etag, a salted pork speciality. I have been trying to eat less and less meat these days, but this was a very worthy of an exception. Added to the wood-fire-boiled-and-roasted chicken soup was Tapui-- a very special year-long fermented rice. It had been opened especially for this occasion by the women. I've never had anything like this before! Nor I doubt will I ever have-- local, 115% organic, double ritual blessed by a shaman and a sacred dance, cooked and eaten in an ancient ritual and place. 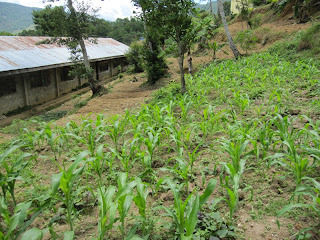 It was served of course with rice harvested and processed by hand from the fields next door. We ate with our bare hands, squatted on the centuries old stones, as dozens of generations had before in a long and unbroken cycle. As we ate my friend explained what had happened during the prayer. The old man had been undoubtedly repeating the prayers he had heared as a child, and which had likewise been passed down over the generations. After asking for blessings of health and a plentiful harvest to the village he had been asking that injuries and accidents prevail upon those in the adjacent villages who had been enemies or competitors. The other old man, had stopped him. "You can't say that anymore!" "Our young men are marrying and moving into those villages more and more these days! They are family now!" There had been a long pause, and as the oneness consciousness had crept into the gathering, the prayer had been changed. The old man resumed. This time he prayed that the men of the village be blessed with great sexual appeal so that the women of the other villages and countries be attracted to them and come settle here instead! Mmmm... That was good soup. Excuse me while I go down to the bar and see if the prayer had any effect!